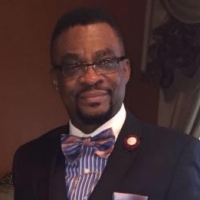 Dr. Darlington I. I. Ndubuike has been a member of Braeswood Assembly of God Church for twenty-four years. He has passion to share with people the Good News of our Lord Jesus Christ through teaching, training, and preparing believers for the Great Commission. He considers it an honor to lead and develop a body of believers in this capacity. Dr. Darlington has served as the Elementary Education Coordinator, Hospitality Ministries Coordinator, Student Ministries and Adult Christian Education teacher. It was with an overwhelming joy and gratitude that he received the call of God to serve in His Vineyard and in the Adult Christian Education Ministry. Through many years of God’s divine guidance in earning a doctorate in Education and a Doctor of Christian Counseling and of serving in the different categories in his church, his calling has been confirmed and strengthened. As a husband to his wonderful wife of 31 years and a father to their four wonderful children ages 30, 26, 23, and 20 who were all raised in this church, he counts himself blessed to be a partaker of God’s immense blessings in his family. Dr. Darlington very well understands the importance of a ministry that not only builds up the body, but also challenges and encourages them to grow and deepen in their relationship with Jesus Christ.